If you are experiencing tooth pain, and our Scarborough dentists determine you need a root canal, don't worry. At Markham Steeles Dental Centre, we will take care of the infection and you! A tooth that has an infection in the root canal may need a root canal procedure to prevent the tooth from being removed. The root canal procedure is done by our dentists using a local anesthetic to minimize any discomfort. The dentist makes a hole in the tooth so they can access the root canal system and remove any infection or dead tissue from the tooth. The area is then filled and sealed and a filling (either temporary or permanent depending on your treatment plan) is placed over the opening in the tooth. After your root canal treatment, you may be a little sore. But by following the aftercare plan created for you by our team, you will soon be feeling much better. We are happy to discuss the cost of a root canal with you - it's important to us that our patients understand the cost of their treatments upfront. If you are looking for a dentist in Scarborough, please consider our conveniently located office at the corner of Markham & Steeles. Our caring, professional staff is here to serve the dental care needs of you and your entire family. Give us a call to book your next appointment, or if you have questions about our hours, services or fees! Conveniently located in the Walmart at Markham and Steeles, we're open late to serve the needs of your family. Our team proudly serves the Scarborough community in English, Cantonese, Mandarin and Arabic. Book your next dental appointment today! 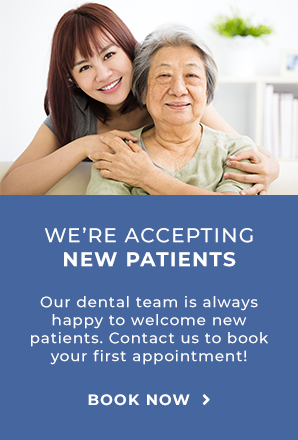 Our team at Markham Steeles Dental Centre are welcoming new patients to our Scarborough dental office. Whether you need a cleaning, dental filling, root canal or other dental services, we can help. Call or email us to book an appointment today!